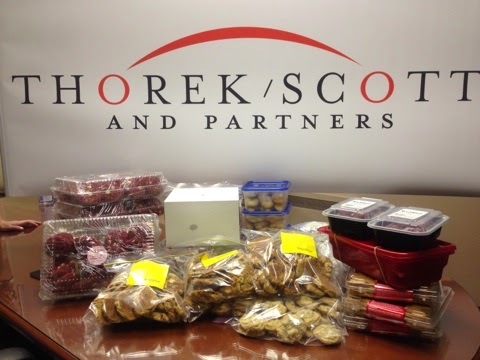 Thorek/Scott & Partners would like to thank everyone who took the time to bake cookies for Out of the Cold's Cookie Drive. We collected over sixty dozen cookies! The winter holidays can be a difficult time of year, especially for those in need. These cookies provide so much more than food - they remind everyone that generosity, charity, and kindness are the best part of the holiday season. The Out of the Cold program is a volunteer initiative that consists of congregations from faith groups, community members and advocates who provide safe refuge, hospitality and emergency shelter to the homeless community throughout the City of Toronto. Each year Thorek/Scott & Partners has the distinct honour of presenting a student in the Master of Mathematical Finance program at the University of Toronto with our Thorek/Scott Scholarship. Last Thursday evening Yifan Zhang graciously accepted this award. An incredibly intelligent young woman who is active in the university community, we could not think of a more deserving candidate for this award. The Mathematical Finance Program at the University of Toronto serves students who will find employment amongst the wealthiest and most sophisticated corporations in the world. Hedge funds, banks, pension plans, multibillion-dollar investment portfolios, and governments across the world seek students from the fastest growing area of applied mathematics. Thorek/Scott & Partners specialize in executive search within the financial industry. As an investor in people, we are passionate about inspiring talent and encouraging success. It is the aim of the Thorek/Scott Scholarship that students in finance can reach their professional goals. At the end of October, Thorek/Scott & Partners had the pleasure of attending The Hammer Band's annual performance at the Heliconian Club. We are proud supporters of The Hammer Band, a program thats offers children outlets and opportunities, such as music, in an effort to end violence and bullying. The performance featured students, teachers, and world renowned violinist Moshe Hammer. The evening was a wonderful success. In our business we talk a lot about the “right fit.” As recruiters it is our job to find candidates that are the right fit for our clients. The concept is nebulous – hard to pinpoint or quantify. We spend a lot of time developing relationships with our candidates and clients in order to try and grasp fit, interrogating personality traits and understanding talents. I recently overheard a colleague talk about the “wrong fit” – that when it’s wrong, it’s wrong, and you know it. My colleague’s adamant tone suggested that knowing when it’s wrong is so much easier than knowing when it’s right. I started to wonder why. I studied English Literature during my undergraduate, a last minute decision after being accepted into the school’s business program. I had focused on business in high school and always imagined I would go into sales and marketing - but something didn’t feel right so I chose English instead. You might be familiar with the concept of “truthiness” coined by comedian and political pundit Stephen Colbert – the idea that truth comes from the gut, not the head. The truth feels right. Politically this might not be a great idea, but maybe personally it makes sense. After my undergrad I decided to return to business. I enrolled at Sheridan College to undertake a Marketing Management certificate. It made sense logically. Business was practical; there were jobs, opportunities, money. In my head it sounded right, but very quickly my gut told me otherwise. It was wrong, really wrong, and I did not complete the program. I never really thought about my undergrad as being the right fit until confronted with the wrong fit. I suppose clarity comes through contrasts. A few months ago, tucked away in the last pages of the Harvard Business review was an article by Daniel McGinn that asks, “Do you really have to fail to succeed?” Inside, McGinn explores our culture’s “reverence” for difficult experiences, and the idea that endurance and the ability to handle hardship are valuable learning experiences. Whether it’s success versus failure, or right fit versus wrong fit, the key is reflection. It is essential to be able to understand your choices, and how they lead to success or failure. I willingly explain my college experience to potential employers. Just because something doesn’t work out the way you planned doesn’t mean you didn’t learn in the process. Success and failure are sides of the same coin, and you must learn to understand both sides. 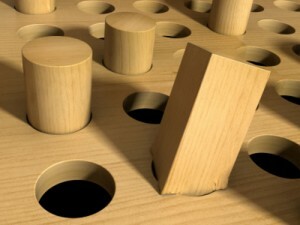 Finding the right fit and avoiding the wrong fit will become and clearer path to follow.